Successfully Added 6.0M CCD Digital Camera - x3 Opitcal + x8 Digital Zoom to your Shopping Cart. 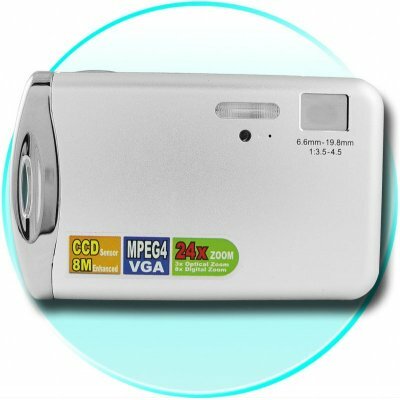 Nice looking Digital Camera with a 1/2.5 Inch 6.0 Megapixel CCD Sensor and 3x Optical Zoom and x8 Digital Zoom for excellent close in picures. Added to his is its impressive Digital Movie function that will take clips at 640x320 resolution and 30fps for great quality. When it comes time to charge this wholesale Digtal Camera, simply place it it the recharging bay without having to worry about taking out and losing the battery. Chinavasion offers this 6 Mega Pixel Camera direct from a well known Camera manufacturer, but with no brand to make sure you get a much lower price than you would every expect from such a great looking camera. Note on Interpolation: Please note that this camera takes images in sizes equivalent to 8.0 megapixels. This is through a software resizing process on the camera called interpolation. The image sensor of this camera has a native resolution of 6.0 megapixels.